If your Coventry home is in need of gutter repairs, look no further than Roofline, a leading provider of professional home improvement services. With more than 15 years experience and expertise, our friendly, family run company are the perfect choice for protecting your home. Why not contact us today to discuss the gutter repair solutions we have for your Coventry home. Call The Roofline Replacement Company on 01455 372 675 and let us help your home with great guttering. We are a Consumer Protection Association (CPA) backed, City and Guilds and Swish Approved installer and come highly recommended by our loyal and happy customers. Our work comes fully guaranteed and we ensure all ur customers are 100% happy with our work and service. We pride ourselves on our outstanding reputation – you can read what our customers have said about us here. 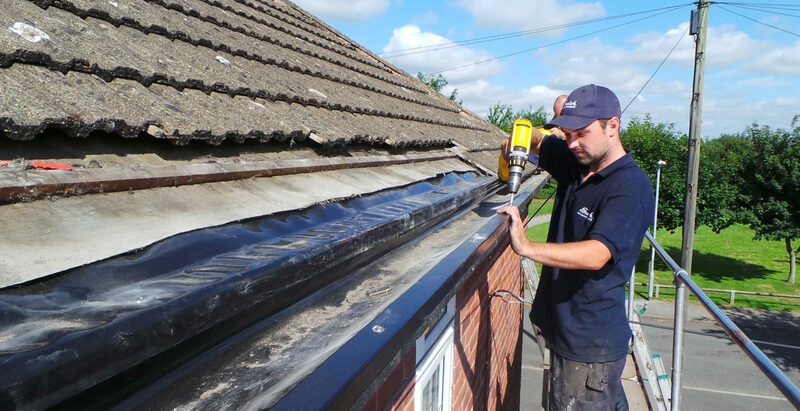 Gutter repairs from Roofline in Coventry can replace all kinds of damaged or leaking existing guttering, including uPVC, aluminium and cast iron. Our strong, durable and seamless aluminium guttering boasts a host of benefits for you and your home. Internal fixings and brackets mean your guttering will be sleek and minimal in appearance, while features such as bird brushes and leaf guards ensure maintenance free protection from the elements. Aluminium gutter repairs to your Coventry home won’t warp or crack as the weather changes and can cope with sun, wind and rain – vital in the Coventry climate! The seamlessness of our one-length aluminium Mustang system means leaks are fully prevented, and all our gutter repairs and replacements come guaranteed – you can enjoy total peace of mind when you choose Roofline. Hardwearing, scratch resistant and so rigid it can take the weight of a ladder, our guttering is really the best your home can get. Thanks to the latest technology, our resin powder coating means your Coventry gutter repairs will not fade or need any painting. Low maintenance gutter repairs mean you’ll never need to climb that precariously placed ladder again so are ideal for those in their retirement years who want to enjoy their beloved home without risk. Gutter repairs from The Roofline Replacement Company are the affordable way to ensure your home is protected now and in the future. A wise investment, great guttering can prevent costly damage to roofs, window frames and exterior walls. Available in white, black or brown, we can match your home’s existing style or give it a different new look. If aluminium is not for you, don’t fear! At Roofline we are also experts in fitting brand new uPVC guttering. If you’d like to hear more about how we can help you, or to arrange your free quotation from our friendly team, call Roofline today on 01455 372 675 and give ghastly gutters their marching orders.